Operating Era: 1898-1980. Pennsylvania RR, Jamison Coal Co., Berwind White, New River & Pocahontas Coal Co., Baltimore & Ohio. 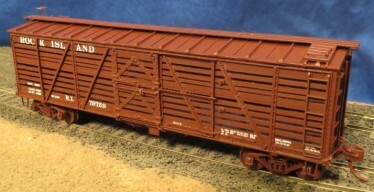 The second Pennsy all-steel design, over 25,000 GLA hoppers were built for the railroad, its susidiaries and the mines it serviced. Delivered both before and after the safety appliances act both styles are modeled in separate kits which feature one-piece hopper interiors for easy assembly. Cars delivered after 1911 and upgraded cars were identical. Standard drop grabs were located at the corners of the end and sides. They ran unchanged until AB brakes were applied in the 1940's. Please note that photo shows retainer in wrong position and AB Reservoir mounted too low.